LAHORE: (Tuesday, July 17, 2018): Punjab University Vice Chancellor Prof Niaz Ahmad has urged the faculty members to realize their role and perform their duties keeping in view national needs. He was addressing a meeting of deans, principals, directors and chairpersons of teaching departments at Al Raazi Hall here on Tuesday. Addressing the meeting, the vice chancellor expressed his resolve to bring PU to the academic esteem which it deserved. 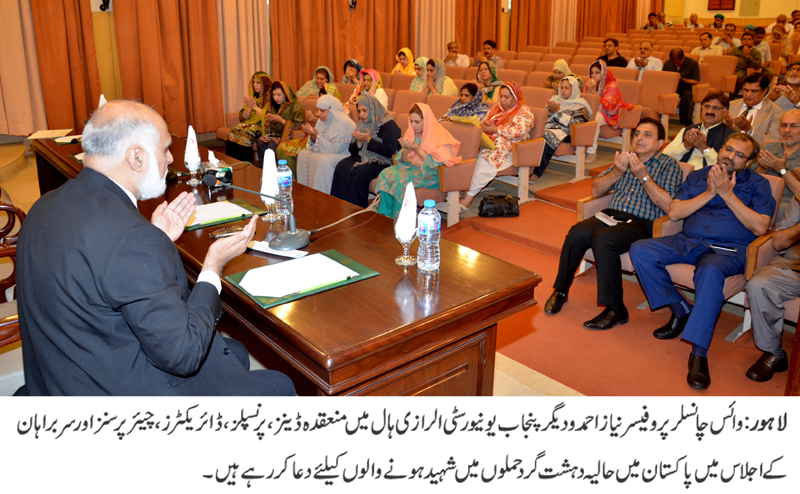 He said that PU administration would focus on quality of teaching and produce graduates of international standard. He said that PU administration would hire the best brain in the faculty. He said that PU admin would integrate all resources and utilize PU’s potential to improve PU’s international ranking. He said that the administration would give authority to relevant deans and chairperson to run their affairs on merit. He said that PU administration was determined to implement merit in all affairs. He said that the administration would maintain student-teacher ratio and vacant faculty positions would be filled purely on merit. He said that the MoUs signed with international and national organizations would be made effective. He said that the administration would also focus on promotion of culture of harmony and respect among faculty members and students. The meeting strongly condemned terrorist attacks in Mastung, Khyber Pakhtunkhwa and other parts of country. The teachers said that these were cowardly attacks and people of Pakistan could not be demoralized through such tactics. They expressed their solidarity with the families of the victims, paid tribute to the martyrs and offered Fateha for the departed souls.